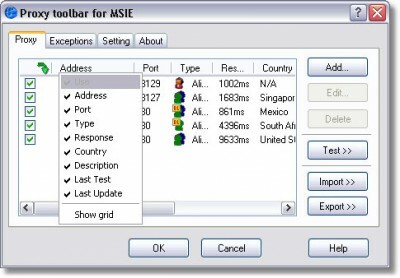 Proxy Toolbar for MSIE 1.4.119 free download. Proxy Toolbar are installed as plug-in components to Microsoft Internet Explorer and gives you the possibility to manage and switch between multiple proxy configurations quickly and easily. You can also use it as an anonymizer to protect your computer from prying eyes. Proxy Toolbar has a built-in feature for checking proxy servers for the country location, response time, presence in the RBL, anonymity check. Internet connection with open HTTP, WHOIS and DNS ports. Proxy server anonymity check is not available. Super Proxy Helper helps you to check proxy, find anonymous, free or fastest proxy, check of proxy status, response time, country, proxy type (Transparent, Anonymous or High anonymity), import and export proxy, download proxy lists from web. The most revolutionary browser yet. TouchNet Browser is a very powerful web browser. Proximat Voyager is the most exciting and fun way to browse the Internet. Tired of wasting time waiting for web pages to load? Are annoying pop-up ads using all your bandwidth? Smart Explorer is the fast, smart, and secure Internet browser. Simpliciti Locked Browser is ideal for use of common access PC's where limited or restricted Internet usage is provided for users in places such as retail, banks, hospitals, libraries, clinics, universities, and schools.